More black babies are born too early or die within their first year of life than white babies…a lot more. Many scientists now believe that the chronic stress of discrimination has an impact on women’s bodies and that social support is a critical mediator of that stress. The Courage to Love: Developing Relational Approaches to Eliminating Disparities in Preterm Birth and Infant Mortality Project is looking at ways that love can be mobilized in communities to reduce the number of babies that are born too early or that die before their first birthday. 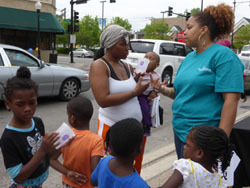 Our project is centered in the Auburn Gresham community of Chicago where rates of pre-term birth and infant mortality are much higher than in predominantly white Chicago neighborhoods. Through conversations with people in the community and the work of a core group of committed and connected thinkers, we are designing a program which will test out this idea and see if it works. Can creating a culture of Loving Community reduce the rate of pre-term births and infant mortality? Watch a brief video introducing the work of the Courage to Love collaborative. 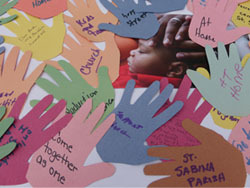 Courage to Love: Addressing Infant Mortality on a Neighborhood Level from Jenn Stanley on Vimeo. Rev. Dr. Ronald David, author of the The Courage to Love report, visited us in June, 2017 to teach us more about how social connection is related to birth outcomes. Take a few minutes and watch Dr. David’s lecture. Find many more resources, reports and articles below! View a presentation that outlines previous efforts to address pre-term birth and infant mortality in Illinois. The Courage to Love was inspired by the work of the Commission on Infant Mortality’s report on infant mortality entitled, The Courage to Love. Find out more about that report and the recommendations of the Commission below. Courage to Love Report Summary. This is a brief overview of the Commission on Infant Mortality and the ideas that shaped its work and report. Courage to Love Report–Inequality Matters. This is the full report of the Commission. Courage to Love–Implications for Care, Research and Policy. This report goes into more depth on the issues and on recommendations for practical policy and practice solutions. Go to Ruth’s House is the testimony of Rev. Dr. Ronald David, the chair of the Commission, to congressional staffers for Congressman Steve Cohen, U.S. House of Representatives, in 2007. Rev. Dr. Shirley Fleming provides an overview of the Courage to Love project and equity issues in infant mortality and pre-term birth. Advocate Health Care and Advocate Children’s Hospital are partners through Advocate’s affiliation with The Center for Faith and Community Health Transformation. Advocate hospitals also do many of the deliveries for families in Auburn Gresham and provide neonatal intensive care unit care for those born too early or with other health issues. Advocates for Community Wellness is a faith-based and Christ centered health promotion and disease prevention ministry with-out walls through monthly wellness forums, participation in health fairs, speakers bureau and hands on nutrition education and cooking classes. 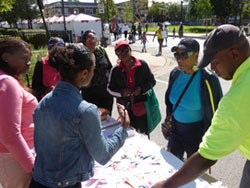 Greater Auburn Gresham Development Corporation works to foster and promote revitalization of the low-to-moderate income communities of Auburn Gresham, Englewood, Greater Grand Crossing and West Chatham. GAGDC is our community anchor partner, provides space for meetings, media and technology support and community networking. 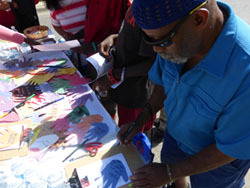 Become: Center for Community Engagement and Social Change amplifies the voice of the community by placing community members at the center of planning, development and evaluation processes and recognizing and facilitating community empowerment. 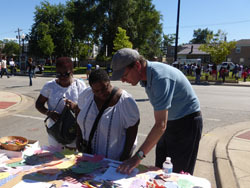 Become often acts as our fiscal agent and grounds our work in community-based, participatory approaches. EverThrive Illlinois is the leading maternal and child health coalition, though their work encompasses the whole family across the lifespan. Their Closing the Gap and Campaign to Save Our Mothers and Babies projects lay strong groundwork on which Courage to Love can build. Northwestern University and Lurie Children’s Hospital, in connection with Dr. Matt Davis, Dr. Nana Matoba and Dr. Kristin Kan. All three are pediatricians and neonatologists who have a strong commitment to improving infant mortality and pre-term birth outcomes, particularly for African American families. 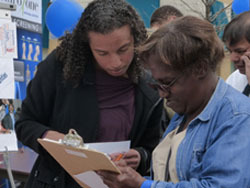 Northwestern University’s Alliance for Research in Chicagoland Communities (ARCC) has been one of the Courage to Love’s key funders and technical assistance partners. 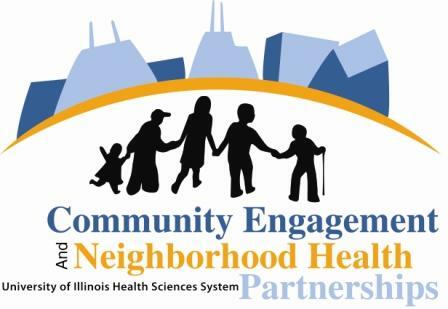 The Office for Community Engagement and Neighborhood Health Partnerships (OCEAN-HP) at the University of Illinois at Chicago supports unique partnerships that enliven the mission of the University of Illinois at Chicago and engage community-serving organizations in cooperative efforts to improve Chicago communities. Major areas of concentration include health professional and lay health worker education, health and wellness education, community-engaged research and community-based health services. 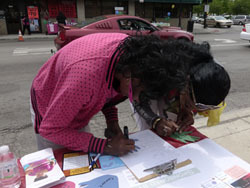 The Center for Faith and Community Health Transformation (The Center) is a joint initiative of Advocate Health Care and the Office for Faith-Based and Neighborhood Health Partnerships (OCEAN-HP) at the University of Illinois at Chicago. The Center promotes health equity by partnering with faith communities to address the social conditions that impact people’s health. 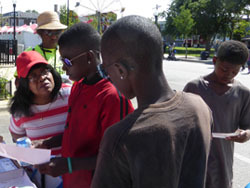 The Center is convener of the Courage to Love and provides adminstrative support.